Home > Cosmetic Surgery > What is Dermabrasion? Dermabrasion is a skin surface procedure designed to improve the feel and appearance of the skin. It works by removing the dermis, the outer layer of skin with the objective of reducing the appearance of scars, freckles and wrinkles. Dermabrasion can also make some types of mole or discolouration fade and become less noticeable. 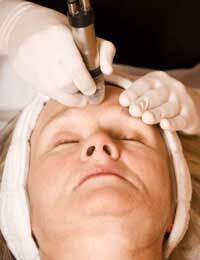 Dermabrasion involves scraping or brushing the skin until the top layers are removed. As this exposed ‘raw’ skin is replaced with new skin cells, the skin tends to tighten slightly and this make the complexion appear fresher and free of blemishes and imperfections. Unlike micro-dermabrasion or laser-dermabrasion, dermabrasion does not use chemicals or lasers. It is therefore cheaper in comparison and the results can be very similar. Dermabrasion – What does it Involve? Dermabrasion works by removing skin by ‘scraping’ it using a handheld, motorised device that’s about the same size as a pen. A small rotating head made from sandpaper or wire brush is used to remove the required number of skin layers, exposing the new skin beneath. In most cases you will need only a local anaesthetic although you should expect some local swelling, redness and discomfort until the skin has healed. Dermabrasion should only be carried out by a qualified plastic or cosmetic surgeon following a thorough consultation, usually with a dermatologist, to identify and help reduce any risks. Dermabrasion usually takes just a few minutes to perform and you can usually expect visible results within just 3 or 4 weeks although temporary side-effects such as skin-sensitivity may occur for up to 6 months or more. For some days after treatment you will be advised not to take part in any strenuous activity as this may increase your chance of bleeding. Dermabrasion is a useful treatment if you want to reduce the signs of ageing on your skin as it can deal with small wrinkles, age spots, freckles and light scarring. It is not cosmetic surgery, so it cannot work miracles or make your skin look 25 years younger. It tends to be used as a treatment to help people with sun-damaged skin, acne scars and blackhead marks but it is also useful for fading tattoos and reducing the visible impact of skin pigmentation. You can have dermabrasion on large areas of your skin but it’s typically used on small areas such as around the mouth, chin, nose and near the eyes, where tell-tale wrinkles are often most obvious, or localised ‘problem’ areas. Although it is usually used on the face, it is possible to have dermabrasion on other areas of your body. If you are considering dermabrasion you should discuss this with a dermatologist or qualified cosmetic surgeon before you go ahead with treatment. It’s important to remember that there are side-effects such as bleeding, which can be exacerbated by some non-prescription and prescription medicines. You shouldn’t stop taking any prescribed medicines unless advised by your GP so it’s a good idea to check before you book any dermabrasion treatments. Dermabrasion is a very effective way of improving the appearance of skin in the short-term but it is far from being a permanent solution. Wrinkles can return as the skin ages and heavy scarring may not always disappear completely. You should also bear in mind that some conditions may mean it won’t be possible for you to have dermabrasion. If you have had recent surgery, you are prone to abnormal scarring, you have a problem with blood flow or you have been diagnosed with an immune disorder, dermabrasion may not be advisable. However, the majority of people who have dermabrasion find the mild discomfort and cost of treatment (from approx £1000) a small price to pay for smoother skin and the elimination of imperfections, and most return for further treatments.